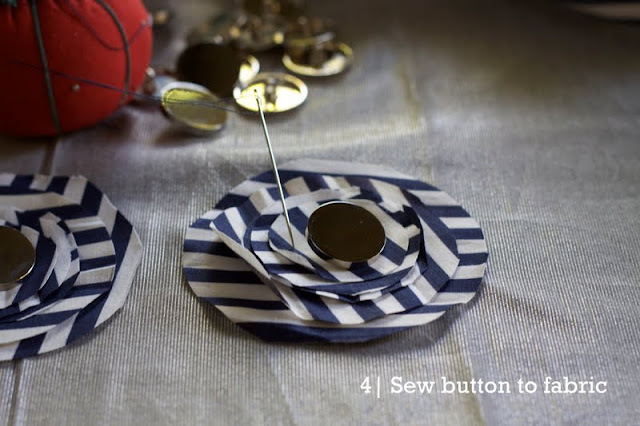 OOH FANCY THAT: .. DIY tutorial | flower shoe clips ..
.. DIY tutorial | flower shoe clips ..
A couple weeks ago, I promised you a tutorial on DIY shoe clips, and I'm happy to present this to you today. This was my first attempt, and I can't wait to do so many more. The possibilities really are endless. They turned out smashingly well, if I do say so myself! I decided to make some quirky, slightly nautical inspired, flower shoe clips with metal button accents. Sounds interesting, right?! Read on for the instructions, and I hope you make some for yourself! 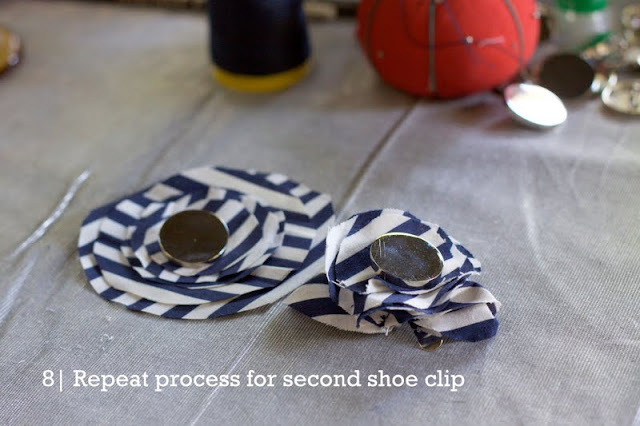 This is just a rough guide on how I made these particular shoe clips, but of course, creativity and deviations from the original are encouraged!! I'd love to see pics if you decide to make some of your own, so please post on the OFT Facebook page. It was so nice outside, that I decided to sit on my porch and work on this project. I think that a beautiful environment always stimulates creativity! Fabric. 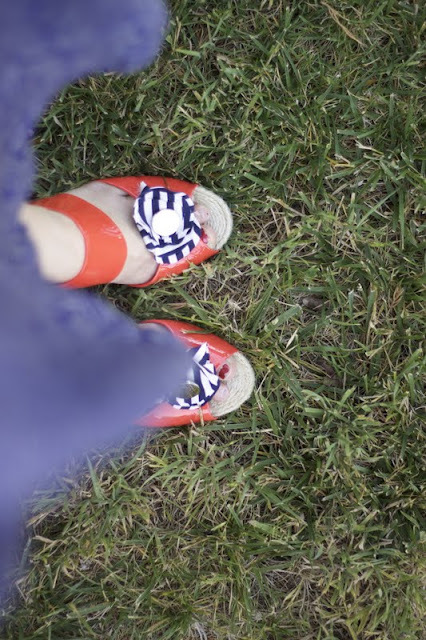 In this case I used some striped cotton ribbon that I had. Two buttons. I chose large metal buttons. 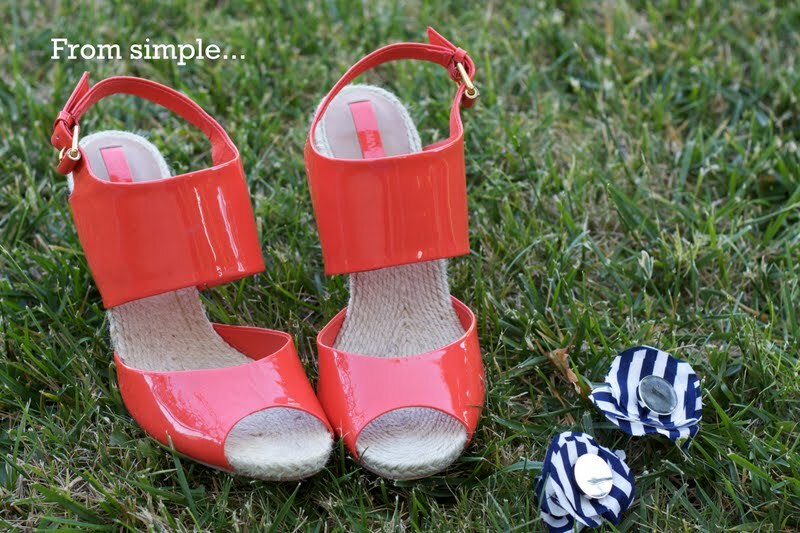 Shoe clips are very inexpensive. 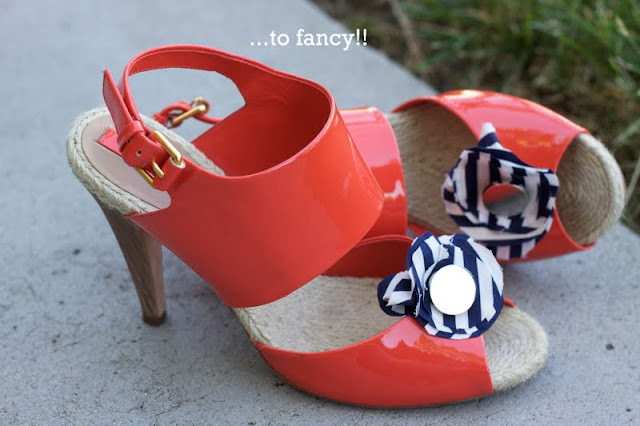 They open and close (via simple hinge) to clip onto almost any type of shoe! 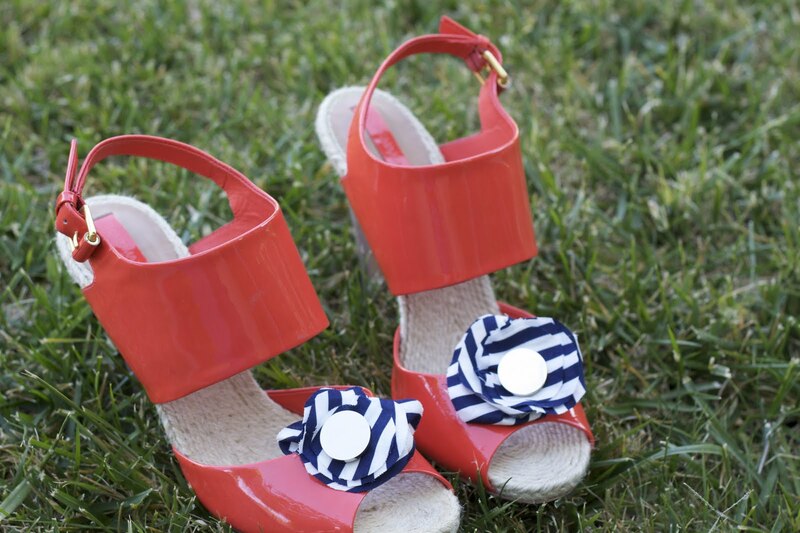 We have clips for our hair, why not have clips for our shoes?! If you have a protractor (I've misplaced mine! ), then it won't be necessary to scour your home for circular objects of varying size. 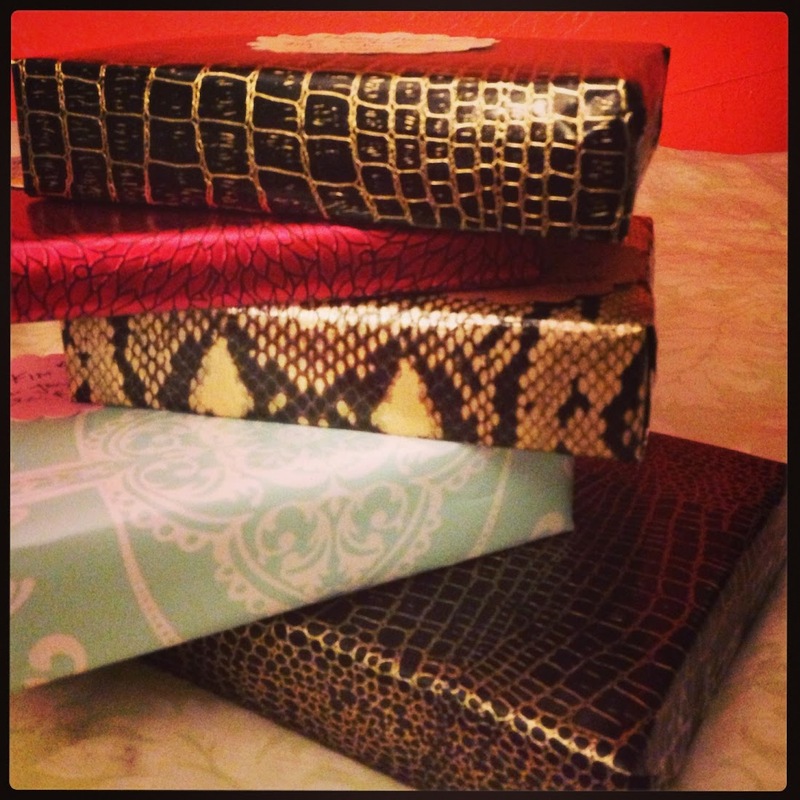 That's what I did though, and found make-up boxes, eyeshadow pots, cups, glitter containers, etc. that worked perfectly. Make sure to draw the circles on the backside of the fabric. 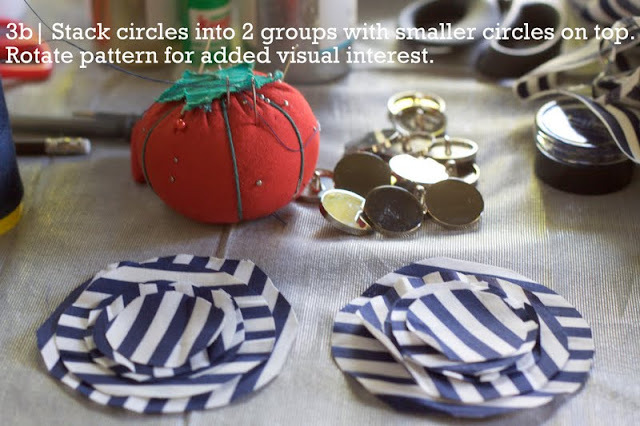 If you don't want to cut all the circles out twice, then fold over your piece of fabric, and just cut once! 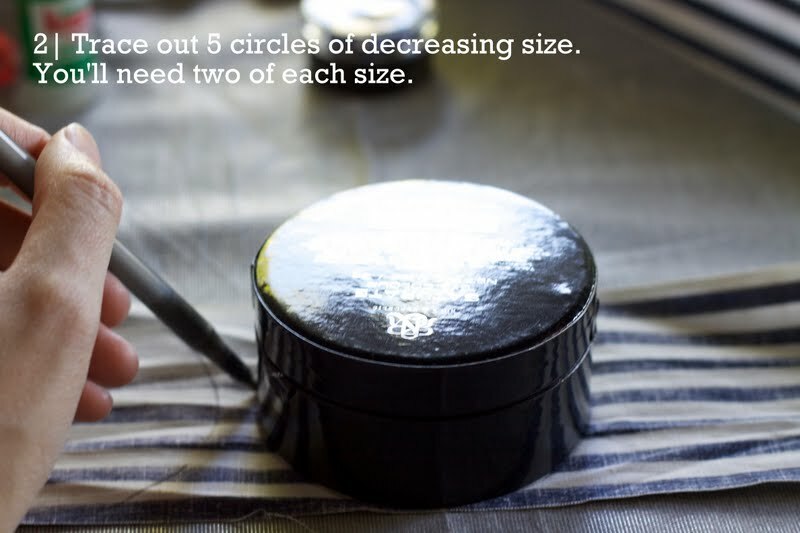 You should have five different sized circles, with two of each size, for a total of ten circles. The number is completely arbitrary, but I think that odd numbers in design always look better. Just make sure you make a pair of everything. I was going to use pinking shears to cut out my circles, but because my pinking shears are crappy, I decided I didn't want the extra hassle. Guess I best invest in a nice pair for the future! 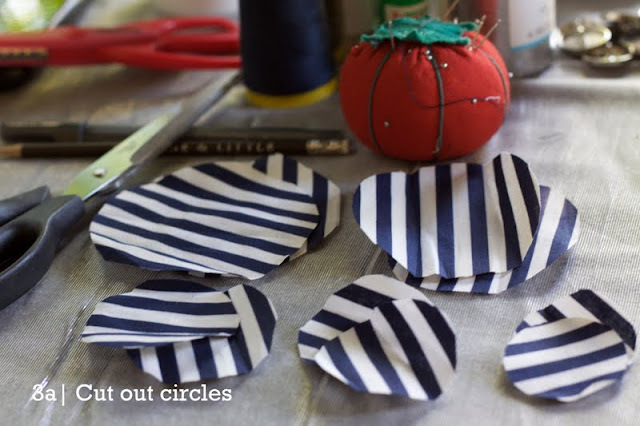 It's not necessary to rotate the pattern, but especially with a striped pattern, I like that the lines were going in different directions, just so that each layer popped more. Seriously, you do not need any sewing ability to do this. Trust me, I'm no expert sewer, and yet I was able to do this. 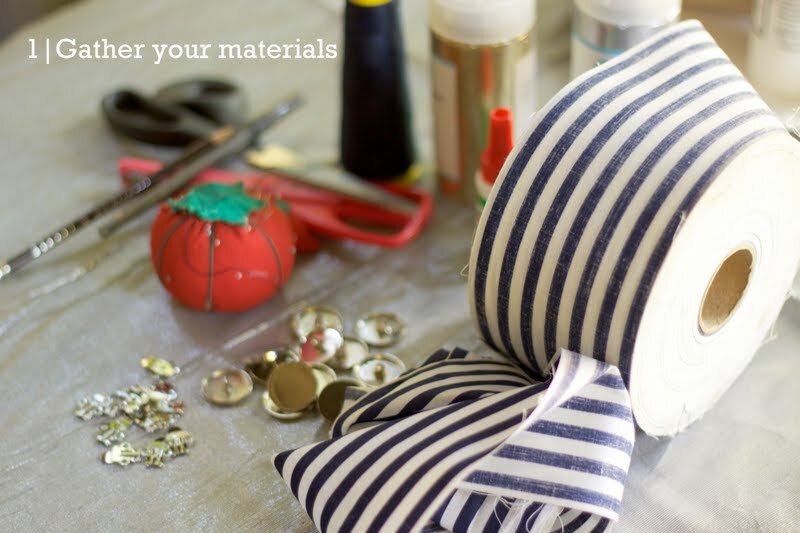 It doesn't have to be pretty, especially because your thread will be on the underside of the fabric. You can leave the "flower" flat (shown above), but I think it looks more interesting when there's some dimension to the fabric. 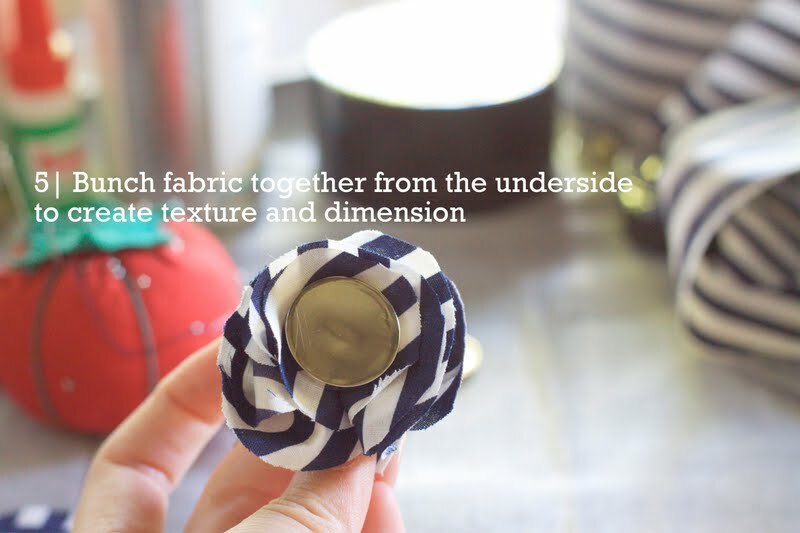 The fabric layers get a bit thick, so you may need the help of a thimble to pull the needle through the fabric. I didn't want to run upstairs to get my thimble, so I just used the hard tabletop to help me when I couldn't pull the needle through. You're going to have to pull the thread through quite a few times to get it really secure as well. To be honest, I found the glue to be completely useless. I was hoping that the glue would be sufficient, but found that I had to sew the clip on, in order for it to really be secure. So, I ended up skipping the glue altogether on the second shoe clip. Same as above, you'll want to pull the thread through many times over to make sure the clip is really tightly secured. Make sure to open your shoe clip, so that's it's lying flat. 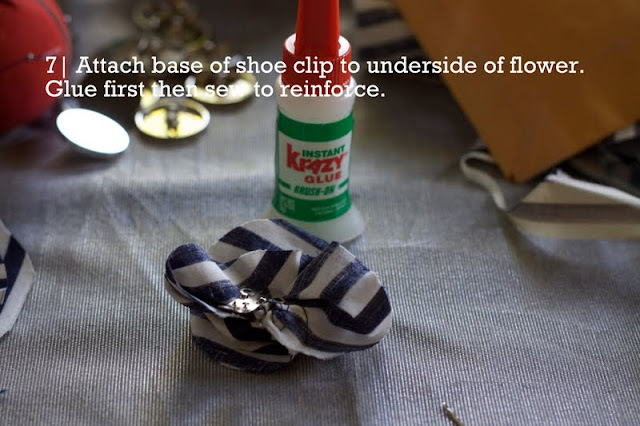 It's much easier to secure the base of the shoe clip to the flower, if you don't have the the other piece in the way. Don't worry, the flowers don't have to be identical. This is somewhat freeform, so I like that each flower clip is a bit different. 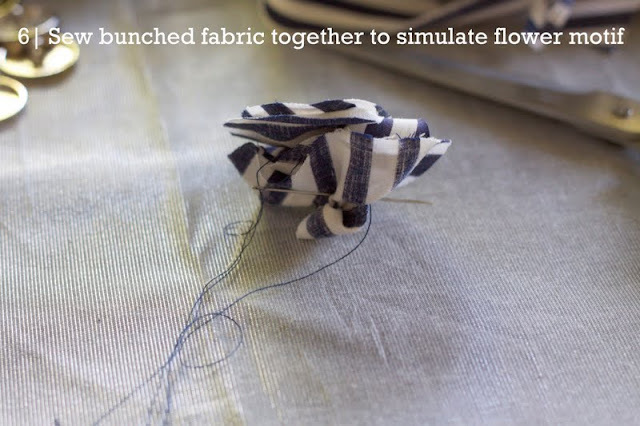 I just made sure that when I was sewing the second flower bud, it was similar in size to the first. Yay, that's it, you're done. It takes a little bit of time, but is really quite simple. Plus, if you make bows, that would take much less time. Also, if you're in no mood to actually design something of your own, you can go out and purchase pre-fab bows, flowers, etc, and just attach them to the metal shoes clips. That would take five minutes, if that!! I couldn't wait to try them out. Please excuse my terribly chipped nail polish...OMG, how embarrassing!! Hehe, I thought the blue and white striped fabric looked nice against my orange patent leather heels, but the best part is I can take them off and put them on so many of my other shoes/heels/ballet flats. I have another idea for some cute shoe clips, so I'll make sure to post pics of those when I'm finished! i love the frayed look on the flower petals. nice detail there that i didn't pick earlier. 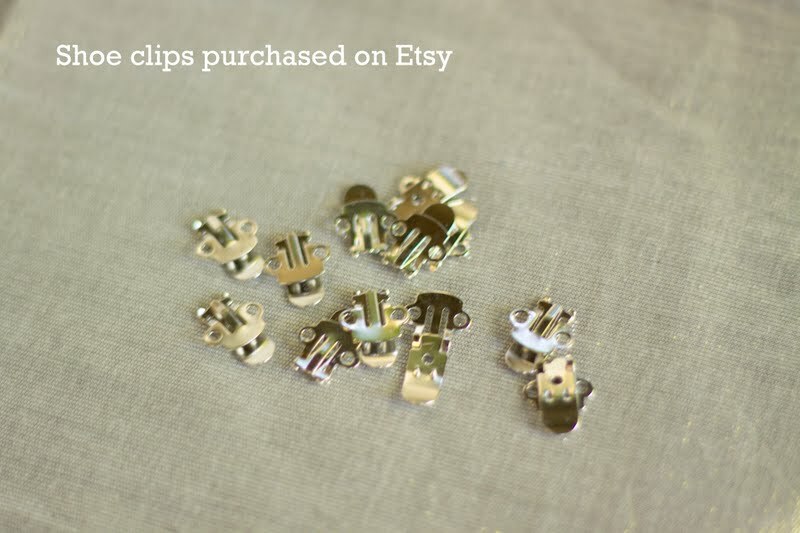 oh, and thanks for posting so many pictures and reminding me what the shoe clips look like!! The fraying is unintentional, but I like it too...as long as it doesn't get too bad!! Hehe, hope you find the clips!